As hard as it is for me to have a proper lunch at home (see here and here for my typical “go-to’s”), it’s virtually impossible when I’m out and about. I will often just throw some cashews and dried cranberries in a Ziploc (with maybe a piece of cheese), but pack a sandwich? Not happening. Which is why I’m such a fan of Larabars – particularly the “Cherry Pie” variety. 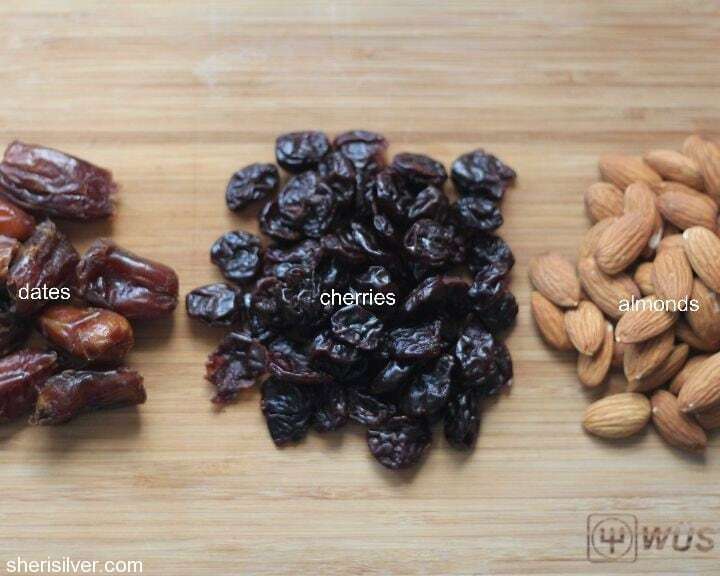 With just 3 ingredients – dates, cherries and almonds – they qualify (for me anyway) as “real” food, and have a decent amount of protein to boot. They are filling enough to keep me going, and I love the convenience – just toss a few bars in my bag and I’m off. 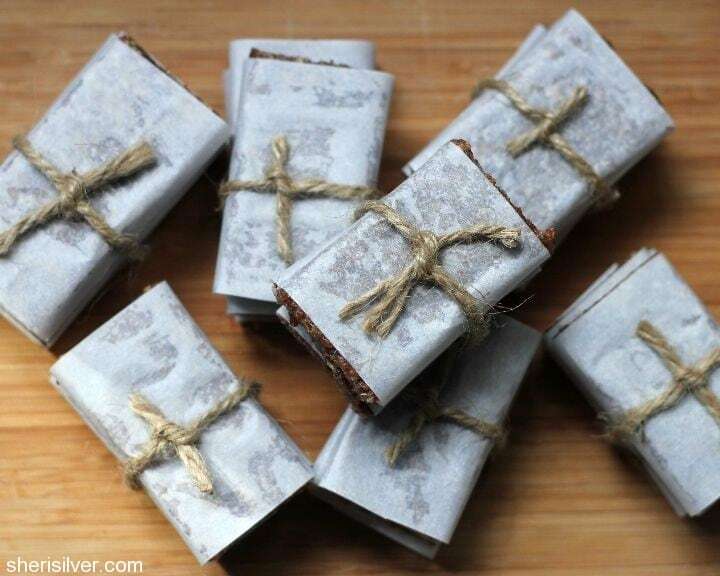 Larabars were a natural for my “D.I.Y.” series, so I set about searching on-line for some recipes – and was shocked to see how many people have made their own! This was great as I had lots of different recipes and techniques to choose from. I settled on the recipe below, as it looked closest to the bars I like – I tweaked it a little and they came out great! I would imagine that you could do any number of riffs on this, to suit your preferences. Let me know if you try them – especially if you make your own variation! And I’m curious – do you have a filling, not-too-junky snack that you like to have on-hand? Please share; I’d be most appreciative! Line a 9 x 13 straight-sided pan with a piece of parchment paper, so that the paper hangs over the long sides. Place the almonds in your food processor and pulse until finely chopped. Add the chocolate and pulse again until finely chopped. Pour mixture into a large bowl; set aside. Place half of the fruit in the food processor and process until a paste forms and clumps together. Add 1 T. of the nut butter and 1/2 of the almond/chocolate mixture; process until evenly combined. Scrape into the prepared pan. Repeat with the remaining fruit, nut butter and almond/chocolate mixture. Scrape into the prepared pan. With slightly wet hands, press the mixture evenly into the bottom of the pan. Fold the excess parchment over the bars to cover, and use something flat and heavy to press down firmly on the mixture until it is smooth (I used a small cutting board). Chill for at least two hours. 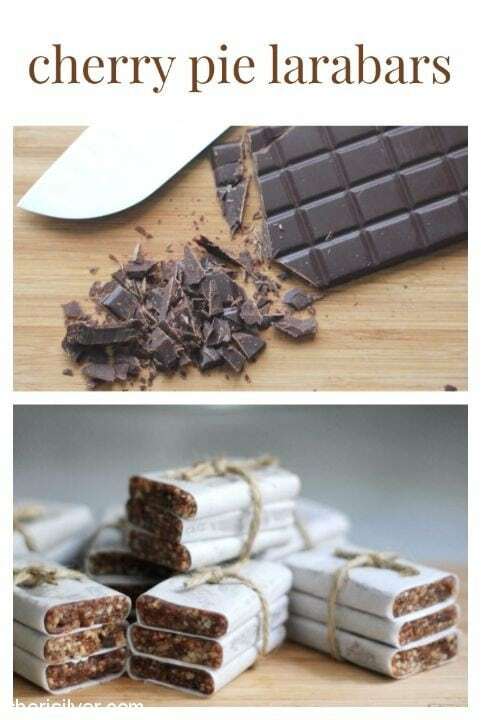 Using the parchment paper as a guide, transfer the bars to a cutting board. Cut into desired shapes (I cut mine into 30 small-ish rectangular bars). Store, covered, in the refrigerator. *I know, I know, I don’t like chocolate, right? But I “kind of ” like dark chocolate, especially when it’s chilled, and it seemed to work well with the recipe. Just go with it. What a great idea. They look delicious and I love your packaging and your pictures as always. I love Larabars. And your recipe makes them seem so easy to make. I’m going to attempt to make them this week. I’m sure they won’t turn out as pretty as yours though! The Cherry Pie variety is my favorite too. 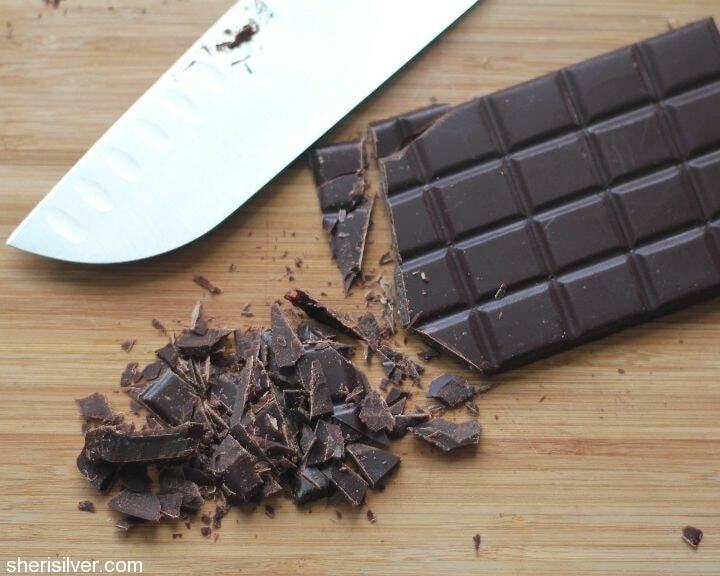 I love the idea of adding dark chocolate to the mix. Thanks for the inspiration, Sheri! I’ve been making and enjoying the granola bars from Alana Chernila’s Homemade Pantry cookbook (see Car Snacks #1). It has rolled oats, puffed millet, toasted almonds, dried fruit, and the sweetener is brown rice syrup, so I figure that it’s on the healthy side of the snack divide. And they’ve been a lifesaver when we’ve been out and the 2-year-old is feeling peckish. I’m looking forward though to trying something new. Yes! And easy too – promise! This is such a fabulous idea!! I’m especially happy to see this recipe because although I LOVE larabars, I’m boycotting them because they are owned by General Mills which just donated a LOT of money to try to defeat the GMO-labeling initiative in California, Hurray for knowing how to make these so I no longer have to give money to a company that is trying to deny people the right to know whether or not they are eating genetically modified foods. Wow – I had no idea! Is there a link to more information about this? Oh – and your blog is seriously gorgeous – so happy to have found you! Thanks for the links – will definitely read up on this! Thank you! Holiday gifts – yes!!! Made these last night but used dried cranberries and walnuts instead of cherries and almonds, as that’s what I had on hand. They are great! Thanks so much for the recipe. I have made these several times, and they are soooo good! Great recipe and easy to make. I even made them for a friend at Christmas by request! do you still make these regularly? 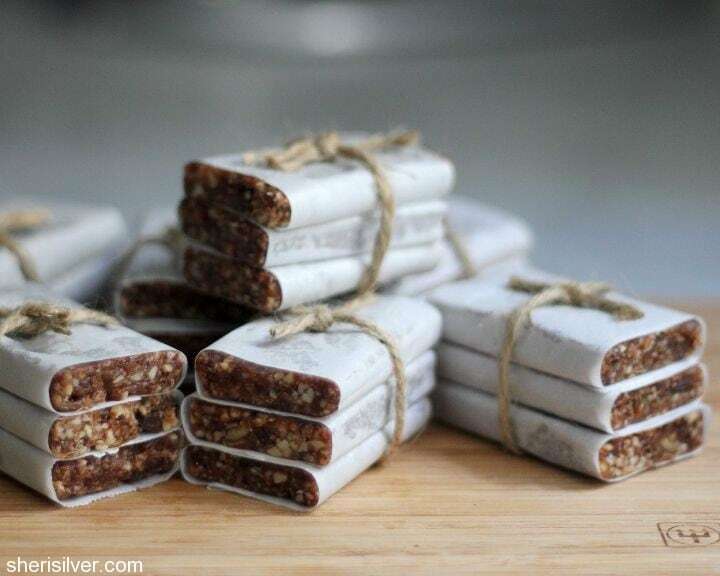 I actually JUST made them – I’m pretty much gluten and dairy free from morning till dinner and these (plus the recipes I made from my balls, bites and bars series) are always on-hand! Any other way than a food processor to do this? I want to start making thus but need to Che k if there a another way without one? It would be hard, I think, as the ingredients really need to be well broken down in order for them to come together and form a bar. I suppose if you chopped everything VERY finely and mixed thoroughly that would work (and be quite a workout! ); let me know if you do!